From the looks of things, Cardi B is doing a-okurrr. Close to 24 hours after announcing her breakup from Offset, the "Bodak Yellow" rapper followed through with her business commitments and helped kick off Art Basel in Miami. Before heading into the event at E11EVEN Miami for a special 21-and-over party, Cardi B arrived on the red carpet looking fierce with her rainbow-colored 'do and black mini dress. However, she didn't stick around for pictures very long. "OK, I'm cold," she said. Once inside, Cardi B could be seen ramping up the crowd and dancing the night away to her hits, including "Money" and "I Like It." She also enjoyed the night with Bad Bunny and Teyana Taylor. After Wednesday's performance, the Grammy nominee will hit the road again and perform at Z100's Jingle Ball in New York City Friday night. As for her husband, he's expected to perform with Migos at the Ted Constant Convocation Center Thursday night. For those who missed the big news, Cardi B took to Instagram Tuesday night and announced she broke up with her husband after one year of marriage. "He's always somebody that I run to to talk to and we got a lot of love for each other but things just haven't been working out between us for a long time and it's nobody's fault," she explained in a social media video. "I guess we grew out of love, but we're not together anymore. I don't know. It might take time to get a divorce and I'm gonna always have a lot of love for him because he is my daughter's father." 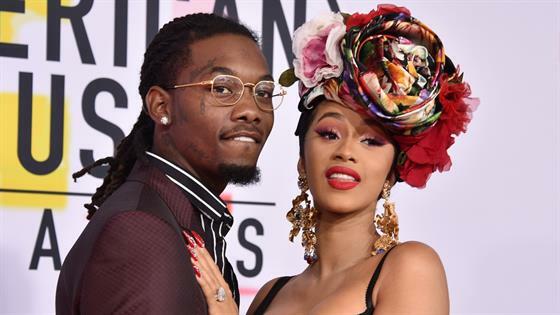 The couple, who welcomed a baby girl named Kulture four months ago, most recently performed together at 102.7 KIISFM's Jingle Ball at The Forum. While both parties are trying to keep the split as private as possible, fans can't help but recall the warning signs that there was trouble in paradise. "Every single day there's rumors about me and my dude. And it almost drives me crazy, because I start to believe them," she admitted to W Magazine. "I don't have no proof. I don't have receipts. But I just got to know my man… I cannot be feeling insecure, to a point that I would drive my dude away, because these people want that to happen."